We are a Full-Service Direct Lender who originates all types of residential loans. • We have over 20 years of experience in the Mortgage Industry. • On-site processing, underwriting, and funding teams committed to closing your loans on time. Submit your loans to us and you will see that No Loan will be Left Behind! · For VA and FHA loans only. · Borrowers with straight salary. · Borrowers with commission income less than 25% of borrowers’ total annual employment income. · Borrowers must NOT be self-employed or employed by family members. Submit only W2 and Pay Stubs for verification of income. Form 4505T – box 6 – Enter W2 and check only box 8. If one of the following situations refers to you, WE CAN HELP! Ø Bankruptcy, Short Sales, Foreclosure. Ø Limited Credit less than 600. Ø High debt-to-income ratio (DTI). Ø Lack of down payment. Ø Rejection by another lender. Come, give us a try and you’ll be impressed with our Speed, Service, and Experience! 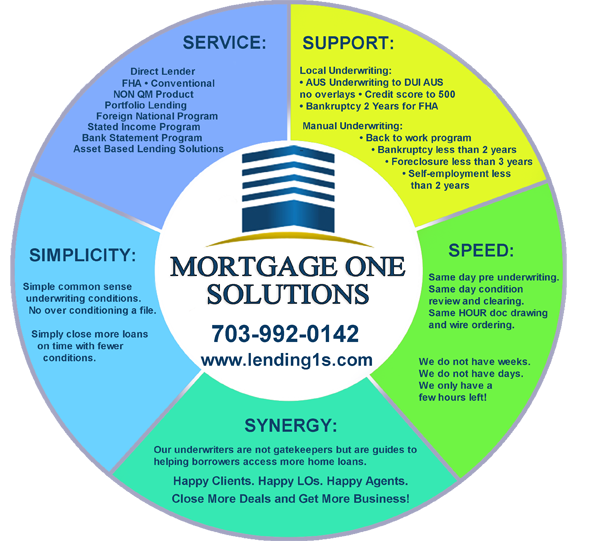 © Copyright 2014 Mortgage One Solutions, Inc. is Licensed by CA Dept of Business Oversight, CA: 4131322, CT: ML-115977 Licensed by CT Dept of Banking, DC: MLB 115977 Licensed by DC Dept of Insurance, Securities and Banking, FL: MLD1057 Licensed by FL Office of Financial Regulation, MD: 14077 Licensed by MD Dept of Labor, Licensing & Reg, OH:SM.501861.000 Licensed by Ohio Division of Financial Institutions, PA: 48857 Licensed by PA Dept of Banking & Securities, RI: 20153081LL Licensed by RI Dept of Business Regulation dba Lending One Solutions is licensed by the Virginia State Corporation Commission. NMLS LICENSE# 115977, VA: MC-3792. A licensee shall not hold itself out to borrowers, through advertising or any means, as a mortgage broker, rather than a residential mortgage lender.